Durable lightweight fabric is Lycra® lined for breathability and patient comfort. XS Right up to 5.5" 7.5"
XS Left up to 5.5" 7.5"
I dislocated my thumb at the mc joint will this protect my thump and keep it safe if I play football? Yes, this brace will support and protect the thumb during sports. I am an AKA and still use crutches while adapting to my prosthetic. I've jammed my hand several times when caught holding the crutches as I fell, as above knee amputees are wont to do! Comes with the territory. But I also have a smallish ganglion cyst on the inside base of my thum. Would a thumb brace help that? I imagine it could keep pressure off the joint? Any suggestions? A brace with a thumb support in it will immobilize the thumb which will help a injury heal. The thumb splint will keep the thumb stiff and not allow you to bend it around the crutches wich may or maynot be beneficial to you. If I have a broken scaphoid can I use this instead of the hard splint the doctor gives me? The Procare ComfortFORM Wristw/Abducted thumb can be used for a stable scafoid fracture although you should speak to your physician before switching braces. I have carpal tunnel and havethe procare comfort form wrist brace. 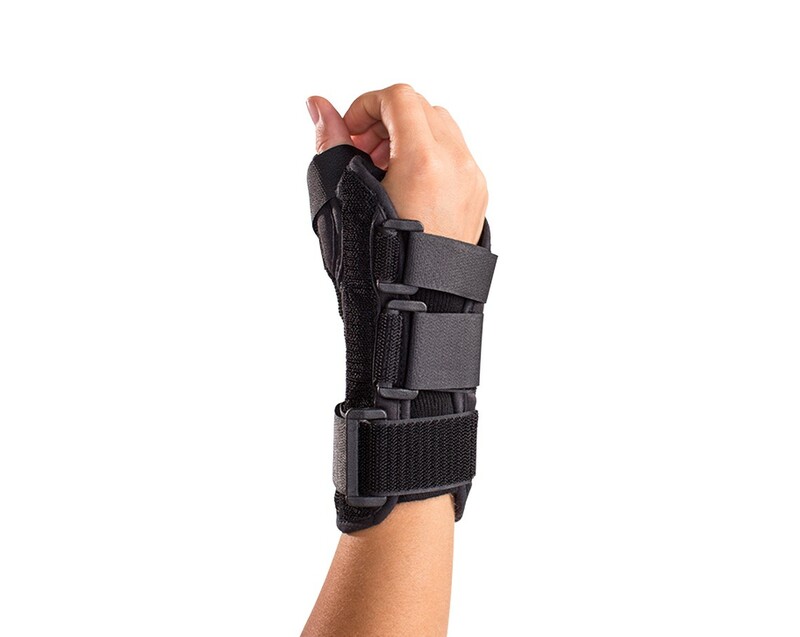 Howis tthis brace beneficial for the carpal tunnel? And how often should the brace be worn? The brace immobilizes the wrist so it stops repetitive motions that can cause the inflammation in the tunnel. The brace can be worn as much as possible. Some start just wearing it at night and others wear it full time. I have tendonitis. Is this brace good for that? Yes, the ProCare ComfortFORM Wrist w/Abducted Thumb will be suitable for tendonitis. It will immobilize the thumb and wrist to help heal and relieve the pain. which braces have the metal strip on top and on the bottom of the brace ? My wrists measure exactly 6.5". Should I order a medium or a large? This thumb brace is made well keeping my thumb in place, reducing pain. Pros: I take less pain medication and I wont need surgery any time soon. Cons: There are no cons when it comes to my brace! This works really well for my 63 year old son. I had wrist pain from too much yoga, which I was making worse with the occasional jolt from planting my ski pole. I mentioned it at a checkup, and the doctor offered this wrist brace as I was leaving the office. I was billed $300 for it, about half of which was paid by insurance. Pros: It is helping protect my wrist during times I might injure it, while enabling me to stay reasonably active (occasional yoga classes and skiing). Cons: The velcro is a little loud and awkward to take on and off in yoga class. Now that I see these braces are relatively inexpensive when purchased directly, I'm eyeing the model that appears to fasten more quietly with elastic ties.